Roberto came to Hope Chapel through the back door. He started attending after he was hired as a part-time worker in Hope in Action. Roberto's wife, Brandy, had attended Hope Chapel as a teenager and returned when invited to a For Women Only event. It was an ad in the Church Classifieds that led him to apply with Hope in Action. Shortly after his hiring, Pastor Zac asked him to assist Pastor Jose Perez with La Esperanza, Hope Chapel's Spanish Speaking daughter-church in Inglewood. 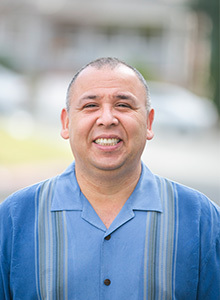 Roberto eventually became the Director of Hope in Action and then an Associate Pastor in 2011. In addition to overseeing the Operations Department for the Church, he leads a Mission Outreach to Nicaragua each year. In addition, His daughter Shekinah plays on the Youth Worship team where she is also a Student Leader in the Youth Ministry. Another daughter, Hannah, serves as a Youth Helper in the Children’s Church and his son, Josiah, is 6 and responsible for helping Roberto keep young and active. Roberto loves exploring the diversity in the City of Los Angles as well being at home surrounded by his family, eating his wife's great cooking, and watching and discussing the latest movies. His quite time is often spent seeking God's presence while working in his garden.